Attracts Hummingbirds, Bees and Butterflies! 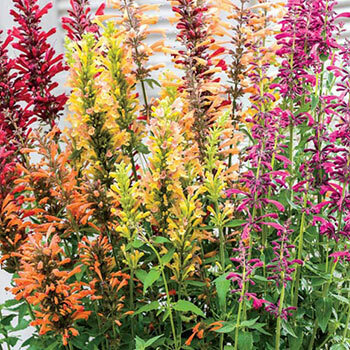 Plant this colorful mixture in a patio container and watch as it attracts hummingbirds and butterflies! 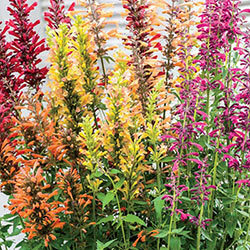 Garden visitors, too, will enjoy the colorful long tubular flowers that bloom from midsummer to fall. Its green leaves have a minty fragrance that deer tend to avoid. Germination Set at the same level as it is in the container. Firm soil and water thoroughly. Foliage Type: Ovate to lance shaped, gray green leaves. Flower Form: Flower spikes with long tubular blooms. Pruning: Remove faded flowers to prevent seeding. Leaves stems to overwinter. Remove new growth in early to mid spring for more flowering stems and more compact plant.